The measurement has been done on 14th of April 2014. 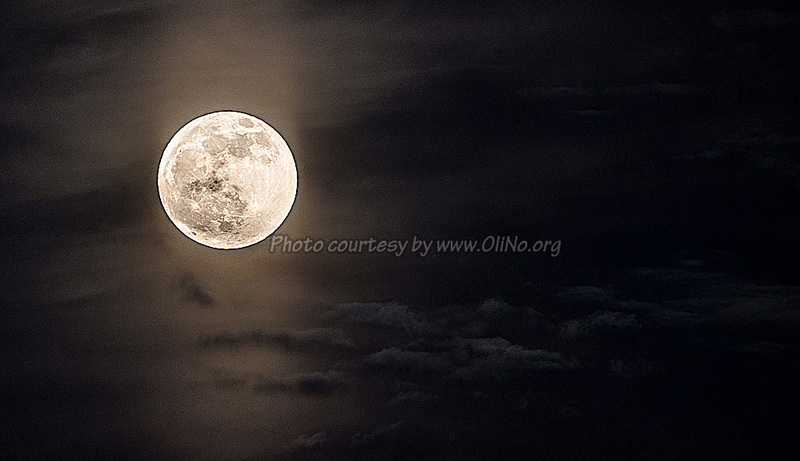 It was an evening with few clouds and we had a full moon, well visible. Taking measurements with the spectrometer SpecBos 1211 can then be done in two ways. 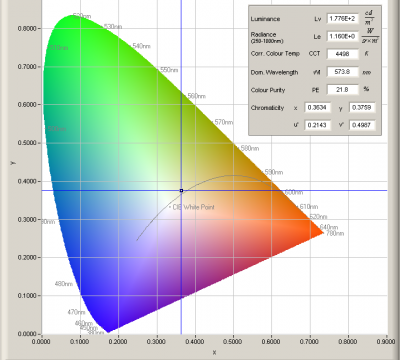 1) measurement of the illuminance (in lux). However the expected illuminance is only 1 lux and that results in a very faint spectrum with signals for each wavelength too close to the noise limit to have a nice signal. 2) measurement of luminance (in Cd/mˆ2), and that requires a very well alignment of the measurement device in the direction of the moon, as the sensitivity area of the device in this mode is only two degrees wide. I mounted the spectrometer on a tripod and kept on aligning and measuring until I had an output with a high signal. Here the spectrum and derived parameters. Lastly an csv-file with the measurement data, which is an average of 24 measurements. And here the file extended with a column for Ee (in W/m^2/nm) and the approximated illuminance value (in lux). 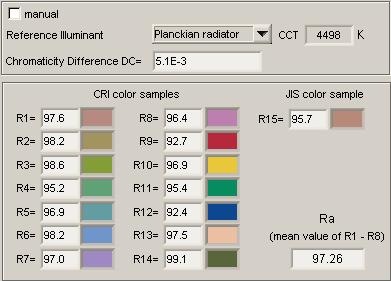 An illuminance value of 0.14 lux is what would be expected. Great job. I was very helpful. I want to thank you very much. Can I repay you somehow? Great work, I’m thinking of doing my PhD on the cooling effects of the moonlight. Do you have the Latitude and Longitude of the experiment location? If I understand correctly, the experiment was done on a full moon. Have you run the experiment on a new moon (Black No Moon) in order to compare the results between the two? Can I use your information in my dissertation and if so, please send me your titles. Dear George. I measured the moon from my address. In the measurement file you can find the time and date. The address coordinates are: latitude: 51.42359906, longitude: 5.40894538. I did not redo the measurement at other moon cycles. It was already hard enough to get a nice measurement with the full moon (I had to point it very precisely as the spectrometer had to be in radiance mode and has then only an acceptance window of 1.8 degrees). This is very well done, original observation. It’s very much appreciated. Do you have any ideas about what might be causing the notch in the lunar light spectrum at about 760 nm? That is an interesting spot on the wavelength line because many IR filters have that as a pass band. I’m hoping there is something to pass. Richard, it seems to me the absorption effect of O2, see also this image from Wiki. Richard- Thank you! Nice work! I’m looking at suppression of melatonin by light and have been told by 1 researcher that we don’t need to worry about moonlight because it contains little to no radiation in the 460nm-480nm range. Your nice ground-based data refutes that. mvdsteen- just a thought.. did you calibrate your integrating sphere first with white light standard and color standard to ensure wavelength and amplitude accuracy? Thanks! Anne, I do agree there is energy in the wavelength range between 460-480 nm. However that amount of energy is very little. If I were to measure it in illuminance, then hat would be probably less than 1 lux. I am not sure whether such small amounts of energy would do anything. About the calibration: the spectrometer I used is calibrated by the supplier every year. He does the calibration on wavelength and also on absolute energy level. This is actually the only spectral data for moonlight that I could find. I am trying to compare the spectral differences between sunlight and moonlight. Accounting for the flux differences and instrumentation differences would you have the spectrum information for sunlight around the same day that you collected this moonlight data? Dear Prahallad. I also could not find any moon spectral data on the internet which is why I measured it. Now I had to measure in luminance mode, since in illuminance mode the signal would be too small. I measured 177 cd/m^2 in luminance mode, while the sensitive field of view for the spectrometer was 1.8 degrees (angular diameter). This corresponds to only 7.8E-4 sr. Assuming to measure illuminance, and also assuming only the moon to be a bright object, I would only have measured 0.14 lux (meaning the 177 cd/m^2 = 177 lm/sr/m^2 and as I have measured this over only 7.8E-4 sr, I multiply the 177 x 7.8E-4 and get 0.14 lm/m^2 is 0.14 lux). This is very small and would require a 60 seconds measurement time and 60 seconds dark measurement time. The resulting spectrum would be slightly higher than noise level of the meter. Now for the sun, I did not measure the sun with the specbos 1211. First, there is a lot of that spectrum to be found on the internet. Second, I cannot measure the sun with the specbos 1211 in luminance mode, since that would directly yield an overexposure. And even in the illuminance mode I would not be able to measure the sun with my specbos 1211 since it can only measure up to 10000 lux and the sun will go much higher than that. So I am sorry, I do not have the sun’s spectrum for you. While I agree there isn’t much benefit to obtaining yet another spectrum of the sun (plenty are out there), spectral features are distinguishable looking at the light of (brightly) illuminated surfaces. Obviously this should have some impact,varying based on setup, but as a first approximation you can get reasonable results in large bands without having to look at the sun directly with equipment that can’t manage. Dear Marcel, thank you very much! You had an excellent initiative. In fact, we can not find spectral data from the moon on the internet and academic journals. Thanks, I really need to check this out. I am thinking of doing more for my PhD measures like these. I want to compare the spectral data of the moonlight on a new moon and full moon. I thought of taking the measurements by attaching a telescope to the spectrophotometer, what do you think? Maybe the signal increases, no? Dear Guido, if you are going to use a spectrometer (you need it in order to get a full spectrum), then I found that you will need a luminance mode, that way the sensor is much more sensitive and also it is sensitive only in one small field angle. Mine has a angular diameter of 1.8 deg=31 mrad, whereas the moo has an angular diameter of 9 mrad, so it is possible to fit the moon inside the angle of view of my spectrometer. The advantage is high sensitivity and that only in a very small field. Would you use a spectrometer with cosine sensitive head, you will need to amplification. The telescope will be of help. Only that the telescope should be able to pass all wavelengths where you are interested in. I expect that the glass will absorb the UV. Oh great! Thanks Marcel, very useful. I really don’t think about the absorption of UV light on the telescope glass. I’m interested in all wavelengths possible, but i think that for my objective study the more important is the spectral beetwen UV and Royayl Blue (360-460nm). But alright I can try make this with telescope might right. I’ll come back here when new questions come up, okay? See you! Dr. Zielinska-Dabkowska that is a fascinating article. Do you have any specific recommendations for schools? Thank you, very helpful data. I would like to compare this light spectrum with a light spectrum of a white light LED that I measured and which I adjusted to an intensity that should be in the range of moonlight. My measurements are spectral irradiance measurments and are given in [W/(sqm*nm)]. 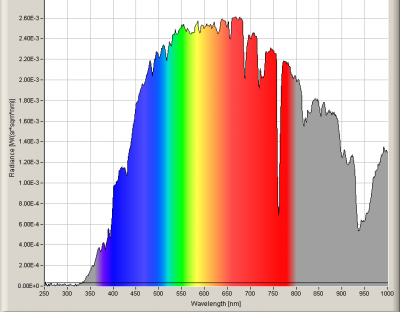 To compare this two spectra I need to convert radiance [W/(sr*sqm*nm)] into irradiance [W/(sqm*nm)]. Could anyone give me advise on how to do that? Thank you! @Martin, I have added a file where there is an additional column with Ee [W/m^2/nm]. This is I think what you asked for. For a sanity check I calculated the illuminance value from that column and it resulted in a value of 1.34 lux, which seems reasonable to me. Dear Marcel, thank you very much for your help! That was exactly what I was looking for. When I compare your spectrum with my white light LED measurement, it falls in a range that I would have expected based on the lux values of the spectra. Well done, I see now that I mistakenly said 1.34 lux but it is 0.134 lux. Which is as expected. Glad you can go forward with the results. Can anybody tell me if the light frequency changes based on the phase of the moon? With new work showing how our brains respond to yellow vs blue light, I am curious. Recently I saw some info in the internet that the moon is self illuminating and that moonlight is different from sunlight. Can anyone tell me: from the light spectrum obtained, does it show that the moonlight is actually different from sunlight? Please forget about the moon reflects the sun that we have been taught in textbook. The Sun’s diameter changes with wavelength, the effective diameter at 21cm is approximately 1.8 degrees whilst at visible wavelengths it is approximately 0.5 degrees. Does the diameter of the Moon change with wavelength or does its far lower temperature preclude this? I was curious about it about 30 minutes ago. after searching a while i came here and i learned a lot from this. thank you so much for providing it to us. Little is known about the camera so I would suspect callibration, but the colour of the lunar surface in many images taken from the near side surface during the Apollo missions also show great variations in colour. It would be very interesting to run your experiments using the same setup from outside of Earths atmosphere, from a high orbit or cislunar space, but that would be very expensive. Very interesting, and good work Marcel. Thanks Marcel! I used the excel with Ee and found a big drop in Irradiance surrounding 517 nm. ~517 nm does not correspond to atmospheric absorption or solar spectra, so could that be surface material on the moon? Any guess what it is? Oh excel was playing its usual tricks on me. The drops are actually at 762nm and 938nm, which I guess are O2 and H2O signals.